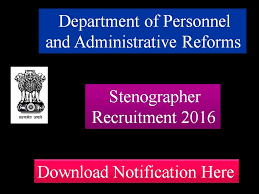 Thus, for it, the department has invited applications from the eligible candidates who want to work around as Stenographer. Those who are interested should send their applications after checking all the requirements provided here below. If any further information is required in this case then, you can refer the official website mentioned below. As usual, like each year, the DPAR released the recruitment notification on its official web portal regarding the process and vacancies available for various posts. It was all about to invite applications and hire the best personnel/staff for all those 41 vacancies. These forty-one posts are for stenographers. Eligible candidates who are interested should apply for it. They are highly advised to fill the application forms for the written examination which will be conducted soon. The form can be accessed by going online on official website. The best persons will be hired after a number of screening rounds. Number of Vacancies: Stenographer Grade II: 41 posts. Educational Qualifications: Passed H.S.C. (12th class) or equivalent from a recognized Board or University. Age Limit: 18-32 years as on 05-02-2016. Pay Scale: Rs.5200 – Rs.20,200, Grade Pay Rs. 2400. How to Apply: Interested aspirants for the post can apply for it by submitting their applications in the prescribed format provided online on the offcial site. They need to send it to the following address. It should be sent and received before the due date of 5:45 pm on 5th February 2016. The late submissions will not be entertained. Click here: To Download Official Notification. Click here: To Apply Online. Stay tuned for latest Government Jobs 2016 updates. Don’t forget to share it on social sites and subscribe to TRT.